In December 11, 1999, Majlisi Oli (Parliament) of the Republic of Tajikistan approved by its decree the State Symbols of the Republic of Tajikistan. In accordance with the decree, the flag and the emblem of Tajikistan are symbols of state sovereignty. 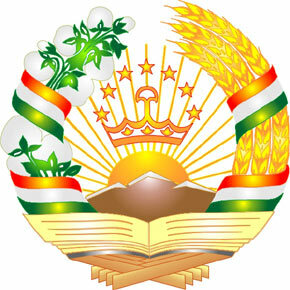 The National Emblem of the Republic of Tajikistan represents the image of stylized crown and semicircle from seven stars on it in the beams of sun arising behind of the mountains, covered with snow and framed by wreath which is made on the right from ears of wheat and on the left from branches of cotton. From above a wreath is interlaced by a three-striped tape and in the bottom sector there is placed a book on the support.